Cook pasta al dente according to package instructions. When cooked, drain the pasta then rinse with cold water to stop it from cooking further. Set aside. In a large skillet, heat 1 tablespoon butter over medium-high heat. Add onions and cook until translucent, about 5 minutes. Add garlic and cook for an additional minute. Use a slotted spoon to remove the onions and garlic from the pan, and set aside. In the same pan, add the remaining 3 tablespoons butter and cook until bubbly. Add flour and cook about 2 minutes, stirring occasionally. Slowly whisk in milk until mixture is thick. Remove from heat and stir in cheddar, Parmesan cheese and Greek yogurt. Mix well. Add generous pinches of salt and pepper to taste. Then stir in the pasta and onion mixture until combined. Serve drizzled with Sriracha sauce. Garnish with optional toppings as desired. * QUICK & EASY VERSION: To make this recipe quicker and easier, substitute Betty Crocker™ Mac and Cheese mix for the homemade version. Then add Sriracha sauce! Kick your mac and cheese up a serrrrrious notch with some Srirrrrracha! Oh man. I’m all for variations on mac and cheese. But this latest one may be one of my new faves. And it’s all thanks to…(you guessed it)…the amazing Sriracha!!! For those of you who don’t know, Sriracha is a fabulous “hot chili sauce” that was once traditionally used on different Asian foods. But now that it’s widely available in the States, it has been fun seeing recipes pop up using it on, well, pretty much everything!! And for good reason. Sriracha does an amazing job at adding that perfect “kick” to your dishes. Which was definitely the case with this mac and cheese! We went with a classic stovetop recipe, and then topped it with a drizzle of the Sriracha goodness. But this would also be fun to serve with some tomatoes and chiles, chopped spinach, veggies, extra cheese for garnish…you name it! There are endless ingredients that could be optional. But the Sriracha is not. Seriously, try it. You can find Sriracha in grocery stores in the Asian section. This spicy mac and cheese is so good, you'll want to dive in. Garnish with some extra yummy toppings if you’d like and enjoy! That's a totally easy recipe right there, just 20 minutes. But, if you want even easier by saving yourself from having to gather up ingredients, just grab a box of Betty Crocker's new Mac and Cheese mix and get it goin' that way instead! End with the Sriracha sauce, and you'll have a winner either way! 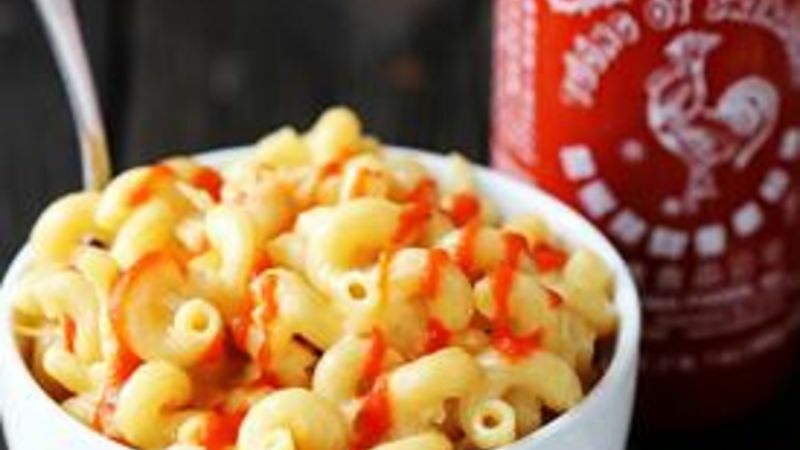 Here are more recipes with a sriracha kick!